Where Should Your Firm's Data Be Stored: In the Cloud, On-Premises or Somewhere Inbetween? 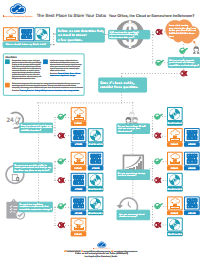 Download the Decision-Tree Infographic Now! Are you having a hard time deciding on where to store your law firm's data? Should your firm's data be in the cloud, on-premises or a hybrid of the two? In this decision-tree infographic, we offer you help in deciding where you should store your law firm's data. Download this decision-tree infographic by filling out the form.